An important step in the process of producing food for our tables is provided by pollinators that transfer pollen and fertilize many seed and fruit- producing plants. Nearly one-third of our food depends on insects for pollination and bees are one of the best pollinators that provide this service. The annual value of pollination to Georgia alone is over $360 million. While many other insects such as flies, beetles, moths, butterflies, and wasps can be important pollinators, bees out-perform them all. The bottom line is that pollination is an ecosystem service, a gift from nature, with economic returns similar to rainfall or soil fertility. However, since the mid-1980s, the number of feral (or wild) honey bee colonies in the U.S. has dramatically decreased so farmers now rely more heavily on managed bees to provide pollination for crops. What are the symptoms of CCD? The main symptom of CCD is very low or no adult honey bees present in the hive but with a live queen and no dead honey bee bodies present. Often there is still honey in the hive, and immature bees (brood) are present. Varroa mites (Varroa destructor) is a virus-transmitting parasite of honey bees and have frequently been found in hives hit by CCD. Pathogens: Among others, scientists are considering Nosema (a pathogenic gut fungi), Israeli Acute Paralysis Virus, and possibly unknown pathogens as possible culprits in CCD. ARS research has indicated that no one pathogen of any class directly correlates with the majority of CCD incidents. Rather, a higher total pathogen load of viruses and bacteria correlates more directly with CCD than any one specific pathogen. Parasites: Varroa mites are often found in honey bee colonies that are affected by CCD. It is not known if the Varroa mites are directly involved or if the viruses that Varroa mites transmit (similar to the way mosquitoes transmit the malaria virus) are a factor in causing CCD. 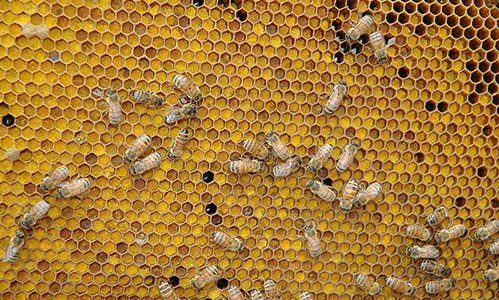 Management stressors: Among the management stressors that are possible contributors to CCD are poor nutrition due to apiary overcrowding and increased migratory stress brought on by the honey bees being transported to multiple locations across the country. Environmental stressors: Such stressors include the impact of pollen/nectar scarcity, lack of diversity in nectar/pollen, availability of only pollen/nectar with low nutritional value, and limited access to water or access only to contaminated water. Stressors also include accidental or intentional exposure to pesticides at lethal or sub-lethal levels. A survey of honey bee colonies revealed no consistent pattern in pesticide levels between healthy and CCD-affected colonies when pollen, bees, and beeswax were tested for the presence of 170 pesticides. The most commonly found pesticide in that study was coumaphos, which is used to treat honey bees for Varroa mites . Have Georgia beekeepers suffered losses from CCD? Yes, most states, including Georgia, have reported losses from CCD. Are neonicotinoid insecticides related to CCD? Scientists are still trying to determine the cause of CCD and have not determined if neonicotinoid insecticides play a role or not. What is the Dept. doing? The Department has participated in the National Honey Bee Survey for the past 4 years. Each year, samples of honey bees and pollen are collected and submitted for analysis. By participating in this national survey, we hope to contribute in identifying any causes of CCD.